The Army Chief General Bipin Rawat, along with Mrs Madhulika Rawat (President Army Wives Welfare Association) and other top military brass visited Chainpur in Gumla District in Jharkhand. Chainpur is the native village of war hero Lance Naik Albert Ekka, who was posthumously awarded Param Vir Chakra (PVC) for his exceptional bravery in the line of duty during the 1971 Indo-Pak war. 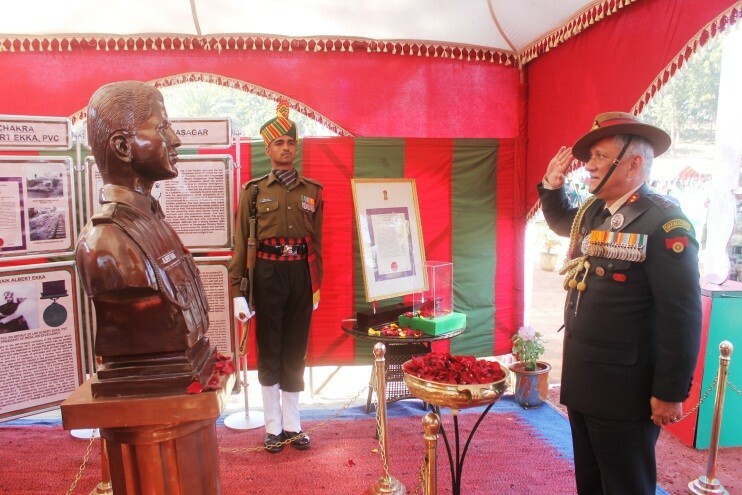 The Army Chief paid homage to the braveheart by laying wreath at his statue at a ceremonial function. This was followed by an ex-servicemen rally at the Barway Ground wherein the Army felicitated Smt Balamdina Ekka, war widow of Lance Naik Albert Ekka and other war widows. The COAS felicitated and interacted with veterans and assured them of the sincere commitment of Army towards their welfare. A mega medical camp was also organized by the Army and civil administration for the ex-Servicemen and local villagers at the venue. The ex-servicemen also got an opportunity to address their pension related anomalies through Grievances Redressal Cells established at the rally site.